Is your mower starting to creak, rattle and squeal as you cut the grass? Is it shaking your arm and giving you a workout from the vibration? Are you longing for a mower that’s self-propelled and can instantly turn those grass clippings to mulch? For a crisp cut and smooth action, consider upgrading to one of MTD’s high quality mowers. Here’s the lowdown on some of MTD’s current offerings and how they compare to the other brands. The TriAction Cutting System is designed to assure you get a clean cut every time. With this system, the grass is pulled through a rake bumper before it is cut. This bumper pulls every blade upright for an even cut every time. The mower deck also extends past the wheels, meaning that you have to make fewer passes with the mower. Choose whether your clippings are mulched, discharged, or bagged. The handle can be set to 3 different height levels. Variable drive speed means that you can set how fast it goes. This mower does not, however, offer the impressive TriAction Cutting System that can be found with some of the MTD mowers. Another mower in the same price range is the Toro Personal Pace Walk Power Mower. It sells at Home Depot for $350 and offers the following features. 3 in 1 bagging system for bagging, mulching or side discharge of clippings. The Personal Pace design allows you to set the mowing speed. A comparable mower for this machine is the Sears Craftsman Platinum 190cc 22” Briggs and Stratton Rear Bag High Wheel Rear Propelled Lawn Mower. Rear wheels are 12” high. Sells through Sears for $340. There are many mowers on the market offering the 3-in-1 features for grass clippings. However, there is only one company offering the impressive and highly effective TriAction cutting system. The expanded deck size on the MTD mowers allows you to cut the lawn without having to overlap every row. The expanded choice for deck height is also very important. Some people prefer the grass long, others want it short. With any of the MTD mowers, you will be able to choose the height that it perfect for your yard and your situation. 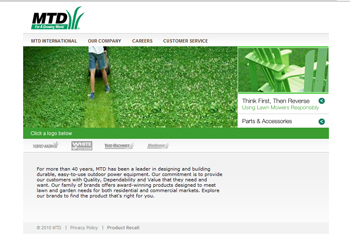 MTD builds a mower that is designed to provide you with many years of quality service and easy use.